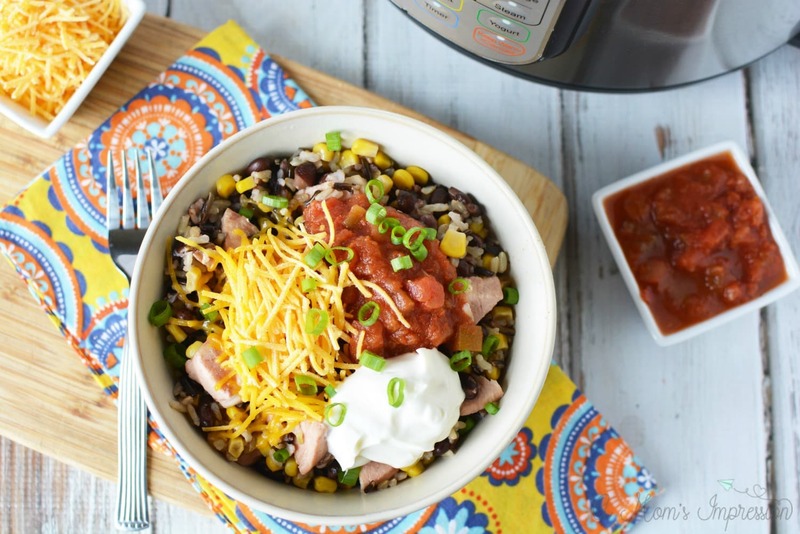 This Instant Pot Chicken Burrito Bowl recipe is perfect for your weekly menu planning. Better than a Chipotle burrito bowl, this chicken recipe is going to be a crowd pleaser! It’s that time of the year when I start thinking about meal prepping for the week. The kids are home and are asking what’s for dinner/lunch all day long. It is nice to plan out a week’s worth of meals and have them refer to it so I don’t have to keep answering the same question over and over. The key to my meal planning success is often my Instant Pot. 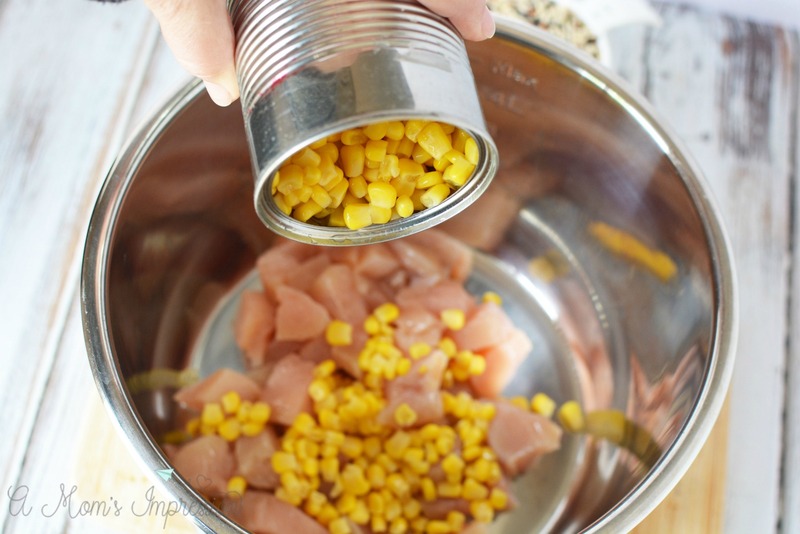 I love finding great meal prep recipes for chicken to use in our pressure cooker. The pressure cooker saves me so much cleanup time, and I can often make enough once to last a couple of meals. 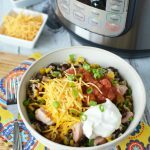 This Instant Pot chicken burrito bowl recipe is one of our favorites. It tastes even better than our favorite take-out Chipotle burrito bowl that I crave all the time, not to mention that it is also much healthier! We make a ton of Instant Pot chicken recipes that we serve over rice like our crowd favorite Instant Pot Cashew Chicken. When we make these, we usually cook the rice seperatly. For burrito bowls, we like to cook the rice right in the same pot as everything else. To do this the right way, you’ll need to pay attention to your grain to liquid ratio for the type of rice you choose to make your burrito bowls with. In this recipe, I used 3 cups of chicken broth because the ratio for wild rice is 1:3. The cooking time for wild rice is 20-30 mins so that is why I chose the mulitgrain function. When I opened my IP, the mixture had a little too much liquid. If this happens to you I suggest to just use a slotted spoon to spoon the mixture into bowls. This is safer (to follow the grain to liquid ratio and have there be extra liquid) rather than having it burn in your IP or open to find the rice is not done. 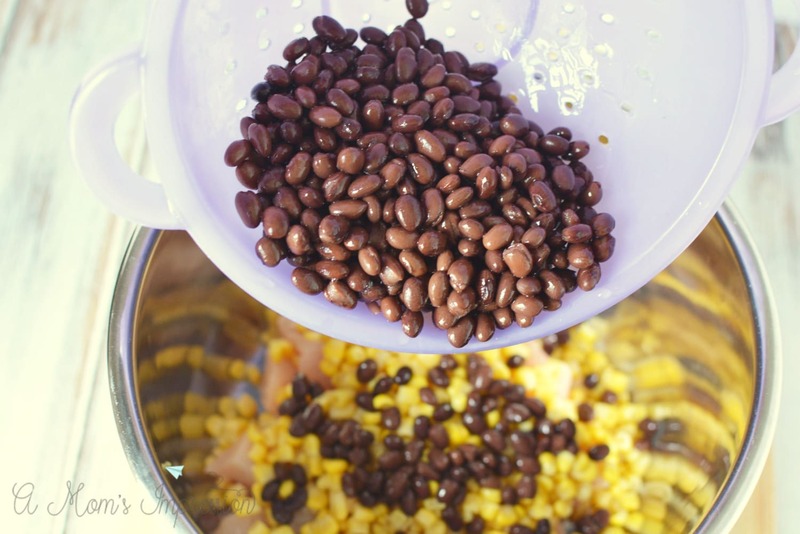 For more tips on using your pressure cooker be sure to check out our guide on converting recipes to your Instant Pot. 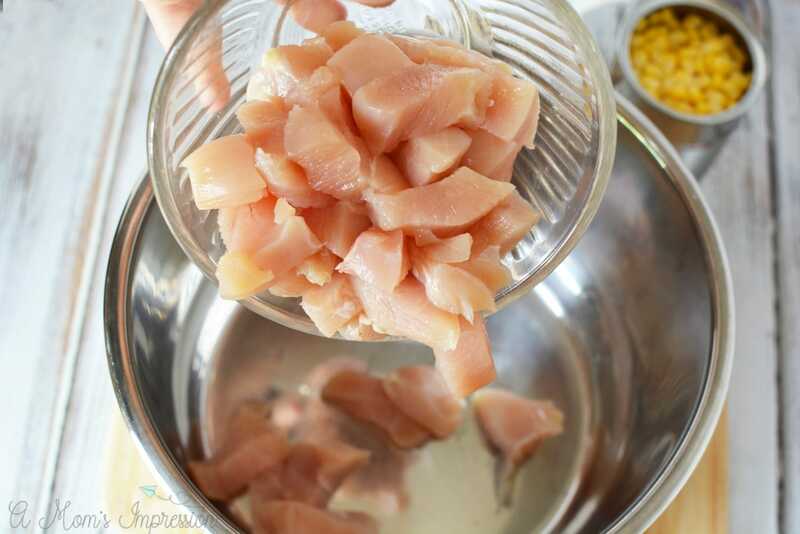 Dice your chicken and add it to your pressure cooker. 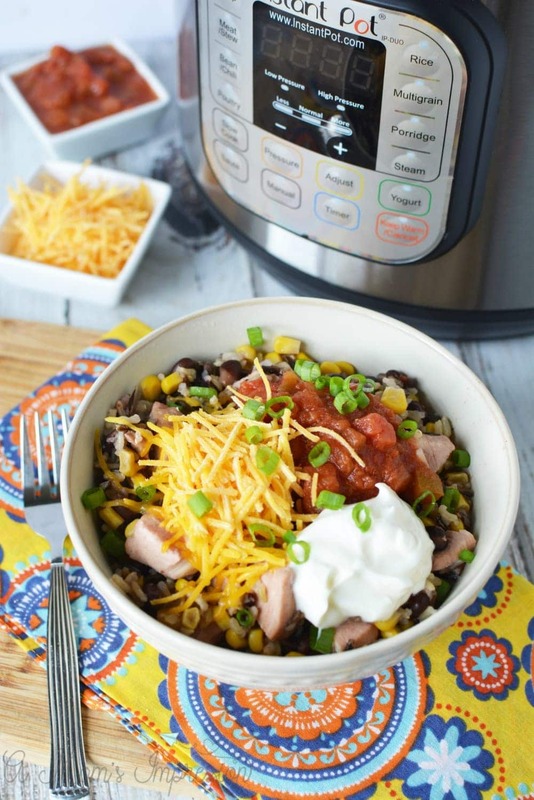 Place chicken, beans, corn, rice and broth in the Instant Pot. Add packet of taco seasoning and mix well. Place the lid on the instant pot and seal it shut. Close the pressure release valve. Set the instant pot to multigrain, normal, high pressure for 20 minutes. When cooking cycle is complete, naturally release pressure for 5 minutes before quick releasing and opening the pot. Spoon mixture into bowls and top with salsa, cheese, onions and sour cream if desired. 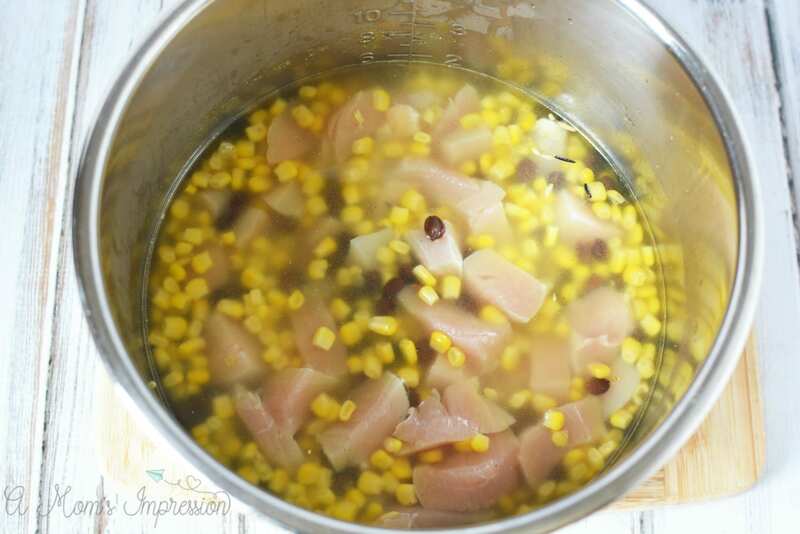 Place chicken, beans, corn, rice, seasoning packet and broth in the instant pot. Mix well. Place the lid on the instant pot and seal it shut. Close the pressure release valve. Set the instant pot to multigrain, normal, high pressure for 20 minutes. When cooking cycle is complete, naturally release pressure for 5 minutes before quick releasing and opening the pot. **For cooking rice, you'll need to pay attention to your grain to liquid ratio for the type of rice you choose to make your burrito bowls with. 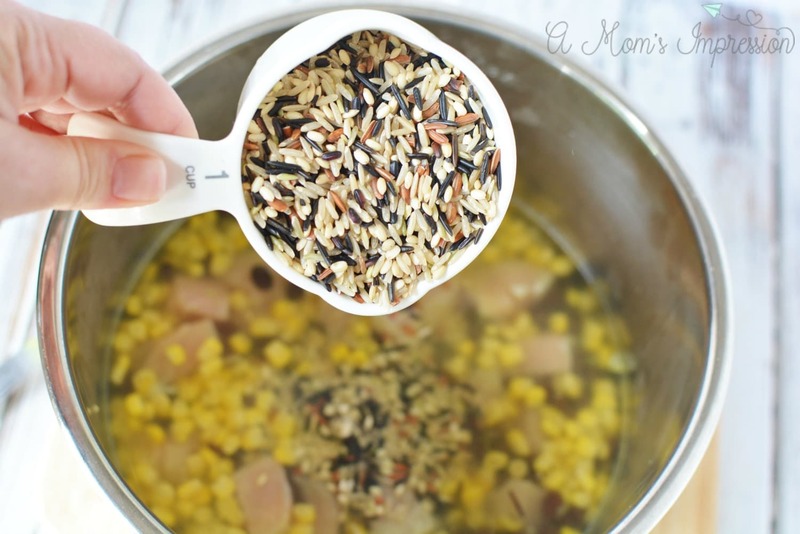 In this recipe I used 3 cups of chicken broth because the ratio for wild rice is 1:3. The cooking time for wild rice is 20-30 mins so that is why I chose the multigrain function. When I opened my IP, the mixture had a little too much liquid. If this happens to you I suggest to just use a slotted spoon to spoon the mixture into bowls. This is safer (to follow the grain to liquid ratio and have there be extra liquid) rather than having it burn in your IP or open to find the rice is not done.